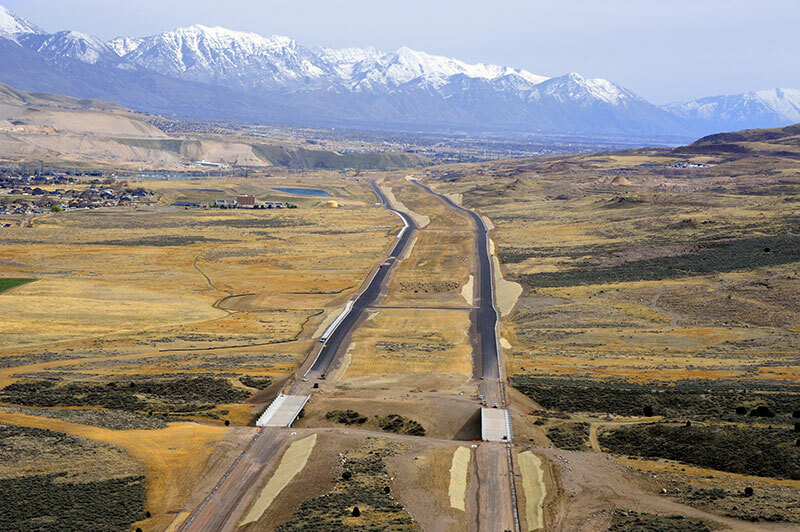 The Mountain View Corridor (MVC) project is a 15-mile new highway in southwest Salt Lake County built using the Construction Management/General Contractor (CMGC) procurement method. The project was constructed for UDOT by Copper Hills Constructors Joint Venture (CHC). The project consisted of 5 segments of one-way roads with two lanes in each direction west of Bangerter Highway that connects Redwood Road near the Point of the Mountain to 5400 South in West Valley. The project’s scope consisted of over 6 million cubic yards of earthwork, 330,000 tons of HMA paving, 300,000 square yards of PCC paving, over 150,000 lineal feet of new drainage, 8 pairs of single span concrete girder bridges and 1 pair of two-span steel girder bridges. Included with the mainline construction is the reconstruction of 12 major city streets that cross or are adjacent to the MVC. At its peak, the project employed over 300 people while work progressed in 7 different municipalities. The PCC paving was placed on 6 of the 15 miles with an additional mile of paving to connect the corridor to Redwood Road. Copper Hills Constructors placed 325,000 square yards of pavement in 101 working days, and provided a high quality product to the owner. The concrete pavement was in the critical path of the schedule when it began and throughout most of its time in the schedule, and CHC was able to complete it without affecting other portions of the work. Using the Construction Management/General Contractor method of procurement, CHC was able to provide opportunities to innovate. These innovations included all aspects of the concrete pavement from maximizing the use of onsite materials with lime treated base, to more accurate placement methods with wireless paving. CHC has provided UDOT with a high quality pavement that will be long lasting and safe for the traveling public. This has allowed UDOT to get the most for their money. This project has received at least 7 awards to-date.